NEW DELHI: India went on high security alert yesterday ahead of the start of its marathon election, after a campaign dominated by Prime Minister Narendra Modi’s leadership that has focused on keeping the country safe from attack. A bomb blast Tuesday blamed on Maoist rebels killed five people, including a lawmaker campaigning for Modi, heightened fears of election bloodshed. Some 80,000 troops, police and paramilitaries will be deployed in troubled Chhattisgarh state-where the attack was carried out-when voting starts Thursday, state police chief D M Awasthi said. Maoist rebels are behind many of the long-simmering insurgencies in at least nine Indian states. But the Election Commission, which organizes the world’s biggest democratic election with 900 million eligible voters choosing 543 MPs, insisted the attack would not change its schedule. Seats in 20 states will be decided on the first of seven days of voting spread over six weeks. Chhattisgarh is among sensitive states where polling is staggered over several weeks so security and administrative staff can be moved around. The killing of a local leader of a Hindu nationalist group in Jammu and Kashmir on Tuesday reinforced fears of trouble during voting. Parts of Kashmir will also vote on Thursday. Gunmen burst into a Jammu hospital and shot dead the regional leader of the right wing Rashtriya Swayamsevak Sangh, which is closely linked to Modi’s party. Tensions also simmered in the eastern state of Odisha where two landmines were recovered by patrols, and in nearby Bihar where two roadside bombs were detonated. Kashmir hit the headlines ahead of the election after 40 paramilitaries were killed in a suicide attack in February. India blamed the attack on a Pakistan-based group and launched a cross-border air raid, which sparked a retaliatory strike by Pakistan that briefly brought the rivals close to a new war. Modi has used India’s action against Pakistan to bolster his strongman image and divert attention from criticism over a lack of jobs across the country and a farmers’ debt crisis. At a rally on Tuesday, Modi urged first-time voters to dedicate their ballot to the military who staged the air strike inside Pakistan. Congress said the speech breached an Election Commission order that political parties should not use the armed forces for propaganda. A biopic of the prime minister has also caused controversy, with the opposition Congress party waging a legal battle to prevent the showing of what it has called unfair propaganda. The film however was given a censors’ certificate earlier in the week after the Supreme Court dismissed an appeal, and will be released yesterday. “We are very happy that we got the ‘U’ (universal) certificate from the Censor Board,” producer Sandeep Ssingh said in a statement. Congress, led by Rahul Gandhi, said the flattering portrayal of Modi would give an unfair advantage to his Hindu nationalist BJP. 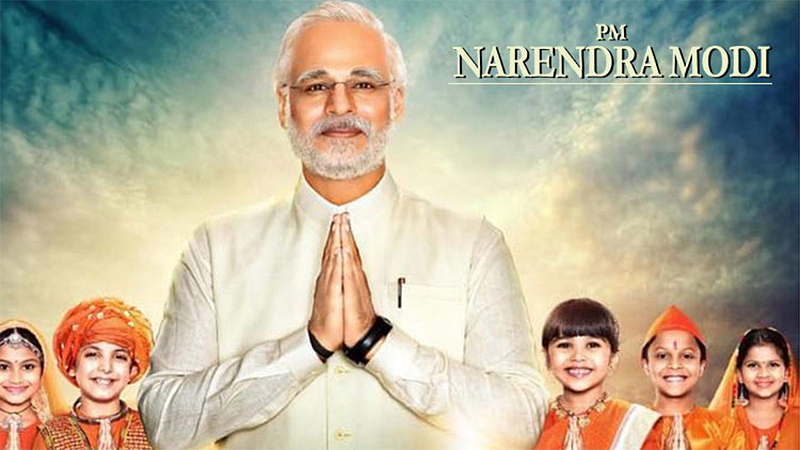 The producers of two TV series were given warning notices by the Election Commission for promoting Modi’s pet schemes through their shows, PTI reported. Under Indian election law, during the 48 hours before a state votes, the publication of any content deemed as campaigning-including adverts, films and even social media-requires Election Commission approval.